Hello Tuesday Morning Sketch challenge fans! We're back with sketch #428 designed by our very own Melissa Craig. This week we're being sponsored by We Are 3 and they're offering a prize of $15 (excludes hand-made cards). This sketch gave me pause for some time, but eventually I came up with a card I was happy with. 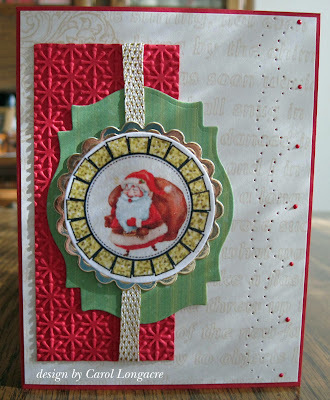 I'm using the We Are 3 Glitter tags Santa image along with the Storybook Christmas papers (green panel and background). Click the photo to enlarge it and you can see the soft, pretty design in the paper. The green panel is streaky because my printer is low on ink (sorry) but it's a beautiful collection of papers. I added a red embossed panel done with a SU! snowburst embossing folder along with some retired SU! ribbon. The green panel was die-cut with a Spellbinders Labels 18 and I used some mirror gold cardstock and a Spellbinders scalloped circle die to make the mat for the image. The piercing on the edge was done with a SU! piercing template and I finished it off with some tiny dots of red liquid pearls. 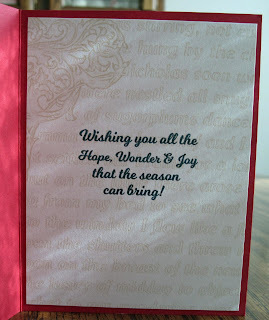 Here is the We Are 3 sentiment called Christmas Greetings that I printed on top of another piece of the Storybook paper (like the front of the card) and placed it inside. You can see the pattern and script a little bit better in this photo (in between the rays of sunlight). 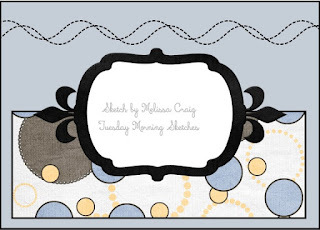 Here's wishing you a wonderful Tuesday and don't forget to check the Tuesday Morning Sketch blog to see what my other teammates have created to inspire you. Thanks for stopping by and have fun with this week's sketch! Great take on the sketch, Carol. I do so love that inside sentiment! Very pretty card! I like how you interpreted the layout with the scallops design on the right. TFS! Such a pretty card. I like the details you've put in this. The "stitch" lines are very pretty, and I definitely like the little red gems between the scallops. 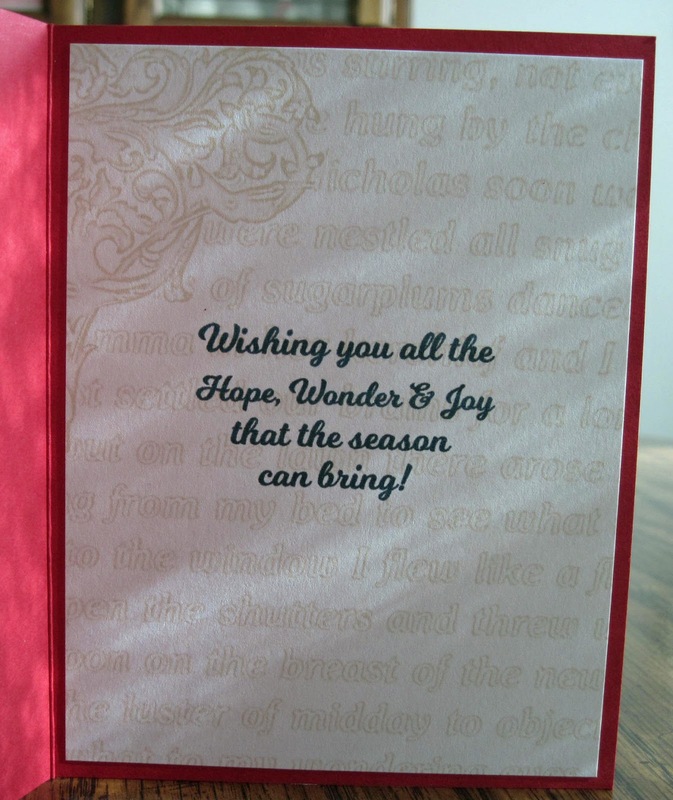 I also very much like the added texture of the embossed piece. Again, beautiful card. Love the way you turned the sketch and used it that way. Also some FANTASTIC piercing on the side!!!! Love it! A super card Carol, a fun Santa image and great take on the sketch. Such great design, Carol! That piercing on the edge looks really lovely, as well the red embossed panel and the "rosette" with the Santa's image! You made a fab interpretation of the sketch! Noooo! Just say no to Santa! (I almost wrote 'satan' so yeah, evil is evil). I do like your card. It is really elegant looking inside and out. I'm just not emotionally prepared for santa. Or satan. Or even that holiday with the turkey... no, not Donald Trump day, the OTHER turkey. A wonderful card design and I like how you turned the sketch pattern around for yours. This is a great Christmas card. SO many pretty details on this Carol, a wonderful result. 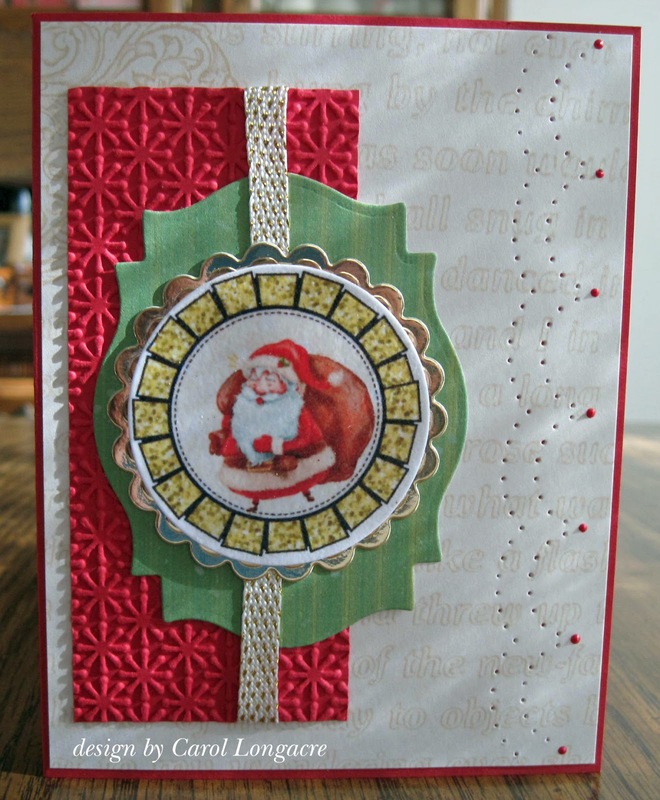 Gorgeous card Carol! I think it's beautiful and I wouldn't have noticed streaky paper. You should have just kept that under your hat. I felt the same as you at first but you sure nailed the sketch Carol. You had a great idea for the inside too! !